Gnomon Workshop Release "Introduction to Substance Painter"
+ The Gnomon Workshop is pleased to announce the release of "Introduction to Substance Painter" with Christophe Desse. In this lecture, Christophe Desse introduces us to the world of Substance Painter. Starting with a detailed introduction to the tools and features, Christophe then goes deeper into the workflow of Substance Painter showing the texturing process on two different subjects. 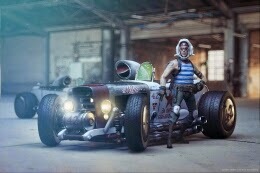 He begins with a detailed car model of a hot rod, showing various techniques that can be used to texture the various components while discussing how to handle the various material settings and maps. He then moves on to the driver, sharing his workflow for character texturing. Many different types of materials are textured and demonstrated, providing a thorough insight into Christophe’s methodology. Lastly, he shares his workflow for setting up shaders, lighting and cameras in the Redshift rendered for Maya, which offers powerful GPU rendering.